August 2015 – He Said What?! We all know the famous Browning poem, “How Do I Love Thee?” Well, I have some thoughts about Aaron, but the title would be “How Do I Embarrass Thee?” As in, how does Aaron embarrass me? Being a southern mama, I would add, “Bless his heart.” And you can take that any way you want. We southern girls certainly know how to do that. You know I love Aaron with all of my heart. You know I love Aaron, every part. But oh, how embarrassing he can be. So today I have a story of three. OK, I’m no Browning……bless my heart. Anyway, today was dental cleaning day for Aaron, so we took off this morning for our beautiful drive north through the country. We drove up 135th street to 53rd, for you local folk, as we headed to the town of Maize and to our dentist’s office there. Aaron was enjoying his day off as we drove by cows and horses and goats and one field of critters that I couldn’t identify. He was really loving the oldies CD that we listened to, and hearing the fact that these were songs from my high school days. Aaron didn’t have time to enjoy the waiting room where he likes to talk to Lee, the receptionist. He was immediately called back for his cleaning. I had urged him to be patient and polite, character traits that run short for him sometimes in the dentist’s chair. And when he walked out about 40 minutes later, I heard him before I saw him. “Mom!” he said. I could tell just from the sound of his voice that he was exasperated. “Let’s go now!” he demanded as he walked into the waiting room. I could tell from the wild look in his eyes that he was upset. Oh dear. So as I checked out and made his new appointment, the hygienist was able to whisper that he was more upset than usual today. He even told her to shut up at one point…..or maybe more than one point. He was just rude and belligerent to her. He doesn’t like the cleanings…..he doesn’t like the feel of it and the time it takes……and he doesn’t like being told over and over to hold his mouth open and to loosen his steel-like lower lip. And of all things, we go every two months to the dentist for cleanings because of how Aaron doesn’t brush well enough. So I knew it was time to stop. Enough talking about mad things. What’s done was done, and I hoped that some of what happened and what I said had made an impression on Aaron. Yet Aaron lives in the moment, so permanent change is doubtful. The next moment in the dentist’s chair may still cause frustration for Aaron. Anyway, the dentist was my first story of embarrassment today. Number two – Pizza Hut. Aaron and I love the Pizza Hut not far from the dentist’s office. It’s fairly new and it has a nice lunch buffet. Aaron loves anywhere that has an all-you-can-eat buffet, because all-you-can-eat is a meal made in heaven for Aaron. He does get my money’s worth! But buffets, where Aaron gets up and down, and is in front of people as he does so, can sometimes max out my embarrassment quota. I can understand when he’s awkward and spills the salad bar cheese on the counter. I often go with him in order to help him hold his plate straight and steady. Pizza sliding off his plate onto the floor has taught me that lesson. I can understand and deal with that, too. But good old Aaron is so happy and relaxed because of the all-you-can eat reality that he will sometimes break out in song. He did that today as he went up to the buffet for what I told him would be his last time. He was remembering the last song we heard on the oldies CD as we parked outside. I had stayed in our booth near the buffet and just watched him as he put two more pieces of pizza on his plate, and as many breadsticks as would fit. Then suddenly he broke out into, “Oh, there’s magic….” Several times, as I watched. And then some passing gas noises. I just sat there and savored the moment. The table of construction guys must have, as well. I didn’t look. Aaron sat down and started talking, loudly, so I did the “Ssshhhh” thing for the umpteenth time. “It’s always, sshhhh!” he complained to me. And I told him it’s because he’s always NOT “ssshhhhing” when he should be “ssshhhhing!” I looked down for a few seconds and looked up to find him with both arms straight up in the air, flashing the peace sign with a look of purpose on his face. “Aaron, arms down,” I said with resignation. At least he was quiet. Peace. Until we were leaving. I had paid the bill, and as I turned to leave, Aaron turned back to the buffet…..where he reached in and grabbed one more bread stick with his FINGERS!!!! He had me talking about mad things again as I hurried him out the door. Number three place of embarrassment – Great Clips, of course. A new girl cut his hair, and today Aaron talked non-stop to her. He told her about his scraped arm, his day group, robots, aliens, movies, and what he had done that morning. “Going to the dentist is not my thing!” he informed her. And of course, he had to tell her about his room being painted. “Do you know what happened on Saturday?” he asked her, sort of breathlessly, as if it was a major and unusual event. She told him she didn’t know what happened on Saturday. “This man came to my house,” he continued. “And he painted my whole wall!” he finished. Like he would paint only part of it? I smiled and the new hairdresser smiled, and everyone there was hearing all of this……aliens, robots, disliked dentist visits, and painted walls. All of it, clearly heard throughout the shop. The girl politely smiled, not sure of what to say with Aaron’s “USED to be young” mom standing right there. Aaron continued. “Yeah, mom knows those songs. She USED to be young.” So then the very composed, somber older lady in the waiting area burst out laughing. So did I. May as well. And as I herded Aaron toward the door, I told this woman that at least Aaron wasn’t discussing my weight. He’s been known to do that, too. You know, there is good embarrassment and there is bad embarrassment. Aaron’s behaviors, such as he showed to his hygienist today, are a bad embarrassment that makes me feel frustrated and sometimes humiliated. Aaron’s good embarrassment when he’s singing at the buffet, flashing the peace sign for all to see, or talking about his mom who USED to be young, can still redden my face. But it’s all fun in the way that Aaron makes it funny. He makes us laugh, even as we may try to hide. I can let it ruin my day because of the embarrassment, or I can let it make my day. I can choose to enjoy Aaron, or I can choose to always be frustrated. Sometimes Aaron needs for me to talk about mad things as I try to help him grow and be appropriate. But many times, I just need to relish the unique person that Aaron is and not let my embarrassment let me miss these special moments with the joy that they can hold. It’s magic, if I allow it to be. Reminds me of a song I knew when I USED to be young. I remember him so well. Richard……….nondescript, uneducated, stinky, and often unwelcome Richard. Our paths crossed because Richard attended the same church where I grew up and where I worshipped. Our paths also crossed because God ordained it to be so. God ordained it to be so………so that I would learn a lesson. It was a lesson best taught by the method that God loves to use – the weak things of the world confounding the mighty. Richard was a very short little man. I often think that he was our version of Zaccheaus there in Princeton, West Virginia where I was raised. Richard didn’t have much education and he was also very simple minded. Today I’m sure he would be classified as being developmentally delayed, at the very least. Yet he had served our country in World War 2, returning to Princeton when his time was up. I remember hearing the story of how Richard wanted to help build the parsonage for our pastor at Johnston Chapel Baptist Church. The men decided that Richard could dig the sidewalk, and so they used twine and little posts to outline the walkway that Richard should dig. As Richard dug, his shovel cut the twine and it veered off to the side……..and Richard continued to follow the twine with his digging. I’m not sure if the men let Richard dig anymore after that or if they found another safer job for him to do. I remember Mom and Dad loading us five kids into the old station wagon and then leaving for church. We never missed a service unless we had a fever or were throwing up, or maybe if blood was involved. This was in the day of services every Sunday morning, Sunday night, Wednesday night, and anything in between. This was also in the day of revival services that lasted at least a week, and sometimes longer if the Spirit led. There were mission conferences, too, as well as other special services thrown in here and there. The Kings did not miss church. If Dad was working, then Mom loaded the station wagon and off we went. I loved going to church, but I always dreaded that drive up Thorn Street because often we would see him………..Richard, standing on one of the corners of Thorn Street, not far from his house. Richard, standing there waiting for a ride to church from one of the church members that he knew would drive by in our little town and see him, and offer him that ride. Richard, whom I was sure never, ever, ever took a bath. The smell was just awful! We kids would strain our necks to look ahead to see if he was still standing there, hoping against hope that some other family had come by before us and picked Richard up. If we saw him, we would beg Mom or Dad not to stop for him………..to let someone else have that privilege on this day. But no……..Mom and Dad would always stop for Richard. He would hop in our already crowded car and immediately we would be assaulted by that odor. We girls learned a trick. We would take a small purse-size container of perfume and try to hide it in our hand as we held it up to our nose. Or at least have some perfume on our wrists that we could sniff in the hopes of blocking out that smell. I’m not sure what John did to combat the odor but at that point it was each King for himself. If no one was able to give Richard a ride, then he would walk to church, regardless of the weather……and that was probably a five mile walk. Richard would talk, talk, talk. He had a very fast, clipped speech. I can still hear him make a comment and then say, “Isn’t that right? Huh? Isn’t that right?” Then he would laugh and launch into something else, and ask again if that was right. If he wasn’t talking, he was making a clicking sound with his tongue, as if he was getting food out from between his teeth. He probably was, since I also doubted that Richard ever, ever brushed his teeth……….which just added to his unique smell. At church, Richard would lean up on the pew in front of him and talk to whomever was sitting there. His eyes would dart between the people as he rapidly talked, and clicked his tongue, and laughed, and said, “Isn’t that right? Huh? 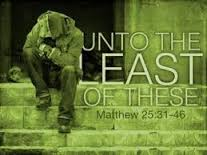 Isn’t that right?” The large church helped to spread his odor out some and keep it from being as strong……….unless you were the fortunate ones who were sitting in front of him and with whom he decided to engage in his mostly one-sided conversation. Needless to say, when I was older and had the opportunity to sit in front of Richard……….I tried to find another seat. Richard, though, was good at math. I remember how that always surprised me. On Wednesday nights, four men would count certain sections of church and then give the number to the pastor out loud as they were called upon to do so. Richard almost always added those numbers faster in his head than Preacher Jimmie could do on paper, and he was usually right. Amazing indeed! And also amazing was the fact that Richard loved the Lord in his own simple way and was one of the most faithful church members that I have ever known. I don’t remember seeing Richard carry a Bible and don’t know if he could read, but he knew his Bible. Time marched on. We King kids grew up, went to college, married and had our own lives. Mom and Dad both eventually retired from their jobs. They continued to be active at Johnston Chapel, enjoying the freedom to spend more time visiting the sick and those who were shut-ins. Among those that they cared for, none stood out more to me than their continued care of Richard. He had aged, of course, and time had taken a toll. Richard was not only feebler, but was also dealing with the ravages of cancer. I know that others helped with Richard, too, but Mom and Dad did a great deal for him in his old age. They helped him find a better house to move into, and then helped him move his meager belongings. They were shocked at what they found as they cleaned his house. Such filth was hard for them to imagine! And there in his closets and throughout his house were stacks of Christmas presents that church friends had given him over the years, still wrapped and unopened. Inside were clothes and toiletries that he surely could have used over the years, but when questioned about it Richard said that he didn’t open them because he didn’t need anything. Mom and Dad bought him clean clothes and new things, but Richard still preferred his old belongings and his old way of living. Mom would take him home-cooked food and encourage him to eat better than he was. She and Dad bought him a small refrigerator to keep his food from spoiling, but Richard refused to plug it in because he didn’t want to waste electricity. Dad helped Richard obtain his VA benefits, and then made sure that Richard started going to the proper doctors at the VA hospital. He took Richard for many of his doctor appointments. This was no easy task in many ways, but none more so than just the pure embarrassment of being in a public waiting room and doctor’s office with poor smelly Richard. Mom and Dad tried countless times to teach Richard and to urge Richard to use better hygiene, but I don’t know that Richard ever took it to heart. Dad would explain things to the doctor, but the people around them that they encountered must have wondered about Richard and about Dad. Eventually Richard’s cancer became more complicated than what the local VA hospital could handle, so Dad took him to the nearest major VA hospital………..in Richmond……….a six hour trip one way. Twelve hours confined in a car with Richard, as well as the time at the doctor appointments. The smell……..the constant talking……….the clicking tongue. Yet Dad just smiled and did what he knew that God would want him to do………..to take care of this little unwanted and unwelcome man. When Dad tried to see if Richard qualified for any other assistance such as Medicaid, it was discovered that Richard had money. In fact, he had too much money to qualify for any government help. Richard never offered to give Mom and Dad, or anyone else, any money for the things they did for him. They wouldn’t have taken the money anyway. That was not the motive. A brother that no one knew about showed up at Richard’s death, and Mom and Dad walked quietly away from any further involvement……..but not before they gave Richard one of their burial plots since he didn’t have anywhere to be buried. Dad is with Richard in heaven now. I sometimes try to imagine it, the two of them together up there. Both have new bodies and are totally equal physically and mentally. Did they hug when they saw each other? Are they ever beside each other as they sing and as they worship? Richard doesn’t smell anymore and Dad doesn’t have to explain him to anybody, or be embarrassed. I wonder if Richard still talks fast, and does Dad still smile patiently at him? I doubt it, but it’s fun to think about. And we kids are left with not only memories, but more importantly, we are left with a real example of selflessness that my parents demonstrated. They loved the unlovely in more than word…………they loved also in deed. I know that each of us has taken this lesson to heart in our own lives in various ways. But I doubt that anyone could be any more kind and any more patient than my sweet parents were to Richard. I can’t wait to see Richard in heaven! I’ll give him a hug……….and no perfume bottle needed! Some of you have asked about how Aaron is doing with his water restrictions. He’s not. As in, he’s not really complying the way that I had foolishly hoped he would. I mean, he’s definitely drinking less than he was before the SODIUM doctor, as Aaron calls him, imposed these horrid restrictions on him. It’s all the doctor’s fault, at this point and to hear Aaron tell it…..unless Aaron’s also mad at me, and then it’s mom’s fault, as well. Can you tell that Aaron isn’t really into this water monitoring business? I threw out the idyllic plan of completely adhering to 56 ounces of water and other fluids a day after the second day. I mean, how do you completely measure all the fluids that enter his mouth? He’s a grown man who can go into the kitchen or even the bathroom at any time he wants and grab a drink of water. Or a water bottle, as he loves to do. More on that later. Then he’s at his day group all day during the week. Even if they try, they can’t tell exactly how much he’s drinking, everywhere he goes, all day. But I do know that he’s drinking far less than he used to drink, and so I’m going to claim success…..to some degree. Oh yes, add on to all the above the fact that he has the autism issues. If you read my last blog about this water subject, I hope you grasped a strong sense of what it’s like for Aaron. For instance, the two cups of coffee when Aaron always has three cups. Now we’re back to three cups of coffee. Aaron isn’t at all adverse to monitoring that aspect of his restrictive life as he stands right beside me, like a supervisor making sure his subordinate is following all the rules. Three cups. Not two. And not with just a little bit of coffee in each cup, either. He’s not blind. He does see and measure the amount. I pour as little as I can to get by with it and yet still keep him content. How low can she go? Aaron will tell me, don’t worry. And…..lest you get the idea that I let Aaron rule the roost around here, it’s not so. But….Gary and I do have to live with Aaron, and a constantly frustrated and angry Aaron is impossible to live with. It’s so easy to assume that he can just handle these changes, but he truly cannot just handle changes like this. It is not in his make-up or his genetics or his brain function to “just handle” such important matters as his all-important coffee and water consumption. One more thing. When Aaron gets angry about something, he will transfer that anger onto whatever else is irritating him at the time. All this fluid nonsense is REALLY irritating him right now. Yesterday he was very impatient about going to Taco Bell. I had told him I would take him, but not until after the last elimination run of the drag race was over. After some time had gone by, Aaron decided that this was taking forever. His impatience flared, and before you knew it, he was talking about sodium……how it doesn’t matter to him, how he doesn’t care about it, how he doesn’t mind getting sick or going back to the hospital. And with his last, “I don’t care!”…..after we had offered another reason why it’s SO important to keep his sodium levels up and his fluids down…..he marched upstairs and drank some orange juice. So there! Later, though, just before bed, he asked if he could have a peach. We sat at the table while he noisily ate each juicy slice and happily talked. All anger was gone, and there was no talk of fluids and sodium. Until he asked, “Mom, is a peach bad for my sodium?” I was relieved to be able to tell him that a peach was NOT bad for his sodium. And I wished he could stop and be as concerned about his sodium when he’s angry as he is when he’s happy. If you read my last blog, you also remember that Aaron always keeps two large water bottles in the kitchen frig. I had to throw them away after our visit with the SODIUM doctor. I replaced them with one little squat 8 ounce water bottle. Not two. One. After Aaron ate his peach, while I rinsed his bowl at the sink, Aaron remembered something. He grabbed my arm and was trying to pull me across the kitchen. I protested, thinking that he wanted to take me to his room to show me some random thing he had done on his computer. But he insisted that what he wanted to show me was right here. He flung open the refrigerator door. And VOILA!! There it was!! 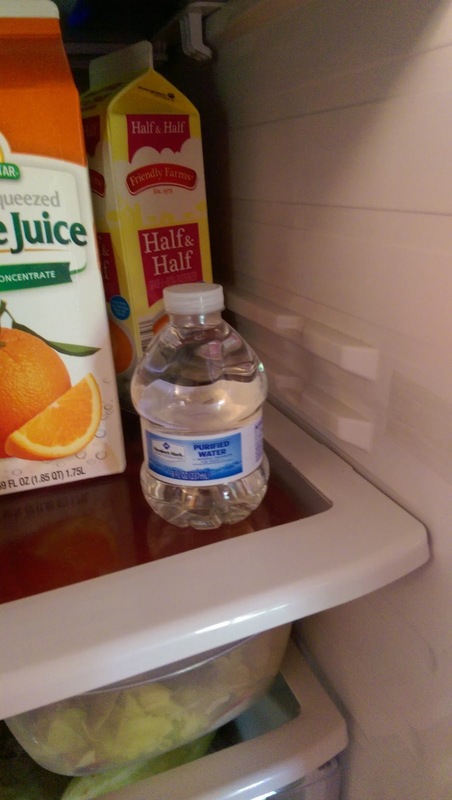 He pointed with great delight to the refrigerator shelf, where there now stood TWO little squat 8 ounce water bottles. Not one. Two. There we have it. Aaron must have two water bottles, even if they are just little squat 8 ounce bottles. He has two. Not one. And there they will remain, those two little bottles. I’m not fighting this battle. We’ll still limit fluids as we can and see how this goes, but there are other methods to increase his sodium. I’m thinking a salt lick right beside his desk. He might think that’s COOL!! Even if it is SODIUM!! When Aaron was hospitalized in June, the biggest concern that his doctors had was his very low sodium count. We knew he also had something else going on because of his high fever. His pneumonia didn’t show on X-rays for a couple days, but the sodium was a huge problem because it can affect the heart. There are at least three reasons why his sodium may have dipped so low. It could be one of his seizure drugs that he’s been taking for years; it may be a syndrome related to the pituitary gland; or it could be that Aaron drinks too much water. Too many fluids can wash sodium and other nutrients out of the body at too great a rate. Dr. Broberg, Aaron’s family practice doctor at McConnell Air Force Base, has been seeing Aaron since his hospital stay. He recently checked Aaron’s sodium levels again, twice, and found that they are once more going down to an unacceptable level. Therefore, he wants us to limit Aaron’s fluid intake to about a liter and a half a day. Now, this sounds like Aaron can still drink a lot but when you consider coffee in the mornings and even the water he drinks with his pills twice a day, there isn’t a whole lot left over for Aaron to just casually drink during the rest of the day. At least it’s not a lot for Aaron, who does love his water. Aaron usually has three cups of coffee in the morning. 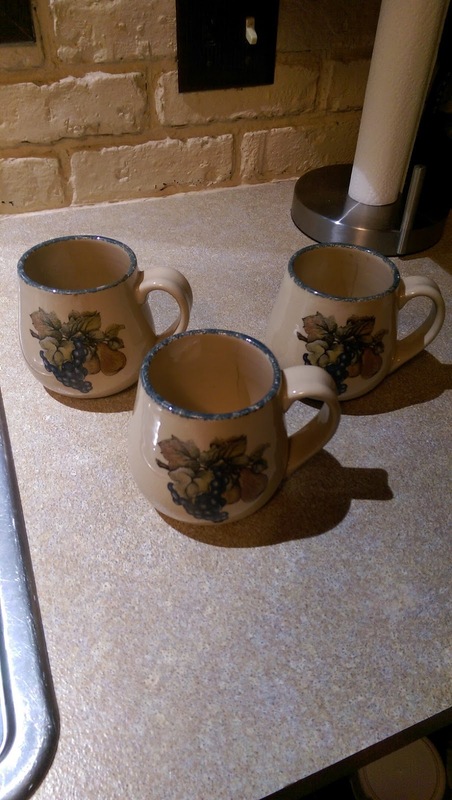 They’re not always full cups, but still there are three cups. Aaron’s a creature of routine, remember, so if he has had three cups of coffee in the past then he wants three cups of coffee in the present. Three. Not two. And definitely not one. Aaron also has two water bottles that he keeps in the frig. Each bottle holds 23.6 ounces. I know that now, because I had to calculate his intake on Thursday, our first full day of our new routine. Aaron loves taking those two water bottles to his room and drinking the water while he watches a movie or plays a game. Two. Not one. Definitely not one. Day Number One: On Thursday morning, I began calculating ounces of fluid before Aaron got out of bed. I decided to give him 10 ounces of coffee, which isn’t much. So I split it between two coffee cups. It really didn’t look like much at that point as I stared down at the halfway filled cups. Well, maybe Aaron wouldn’t notice, I thought. Silly me. Then I allowed him 5 ounces of water to drink with his pills, and that would be his morning allowance. I didn’t phrase it that way with Aaron. In fact, I didn’t say anything about restrictions or allowances when Aaron plodded into the kitchen that morning. I just poured his coffee as he stared at the empty carafe when I was finished. I poured his pill water, which he usually does, as he continued to stare. He was doing his own calculations, I just knew it, and it didn’t have anything to do with wanting to comply with doctor’s orders. It had everything to do with restrictions, even though I didn’t say that ugly word. It had everything to do with his routine, as well. I tried to be as normal as possible and as happy as could be without being weird, as Aaron would call me if he sensed that I was being fake. Finally, he said something about only two cups of coffee. Oh boy. He was pondering that dismal outlook as I left his room, where I had put his two cups beside his desk……in the place where there are usually three cups. Two cups. Not three. The rest of the morning was without incident. I let our Great Dane ride with us as I took Aaron to Paradigm. Aaron loves that and I wanted Aaron to love as much as he could on this day of the beginning of restrictions. Aaron was happy for me to run into Paradigm and discuss the fluid situation with Barb, telling her of the need to monitor Aaron’s intake. She saw the difficulty in this prospect for Aaron, though she didn’t say a lot about that element. The looks between us spoke volumes. When Aaron got home that day, he told me that he didn’t drink anything while at Paradigm. I told him that he didn’t have to go without water all day. 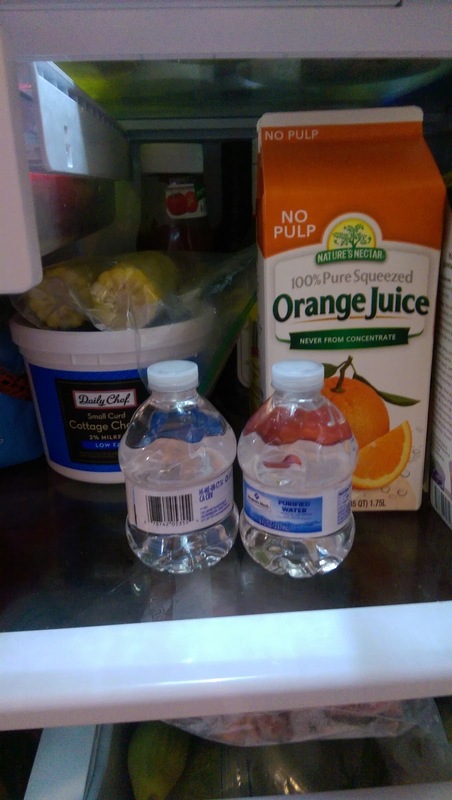 He took that to heart as he later reached into the refrigerator for his two water bottles, which I should have replaced with smaller bottles earlier. As he started to take the two bottles, I told him to take one bottle instead. One. Not two. Furthermore, I told him to drink half of the bottle now and then save the other half until later. Surprisingly, he agreed. He was fine for the remainder of the evening, even joking about drinking his other water bottle but not touching it at all. So far, so good. Well, he laid it out on the table first thing. Now to deal with it. God said to ask for wisdom when we need it, so I did. Not out loud. Aaron would have thought I was weird. “Do I have a doctor appointment?” he asked. He was wondering about the next week. I told him that he did have a doctor visit scheduled. “Is it that SODIUM doctor?” he asked with emphasis. I told him that it was not Dr. Broberg, careful to use his name, but was with his seizure doctor. I gently tried to clear Dr. Broberg of all sodium charges, explaining Aaron’s situation and history, but of course this all meant little to Aaron. He was simply dreading another long day of drinking only one water bottle. One. Not two. He watched me as I got up from the table and starting getting out his coffee cups. “Can I have three cups of coffee?” he asked. “Those two went by fast!” he added. Oh Aaron, you do make me smile even in the midst of your frustration. So I did give him three cups of coffee, which exceeded my desired liquid limit for him…..but the cups were only about half full. He noticed this, of course, and I reminded him that he often has half full cups of coffee since he is often shaky. He accepted that explanation, and I carried his half full cups of coffee up to his room, where I set them in their usual place. Three cups. Not two. Aaron was moderately happy, but still suspicious. Later, as I was drying my hair, Aaron strode in the bathroom. He had a smile, and now it was my turn to be suspicious. My instincts were correct. I just stood there. I wanted to laugh and I wanted to lecture, but I was truly relishing his method. He remembered that I had instructed him the day before to drink half of his water bottle. So on this morning, he decided that referencing those “halves” would soften the blow of his disobedience. Pretty clever, actually. I wanted to tell him that for two water bottles, he really should have added another half to his list. But I decided that this wasn’t the time for a math lesson. 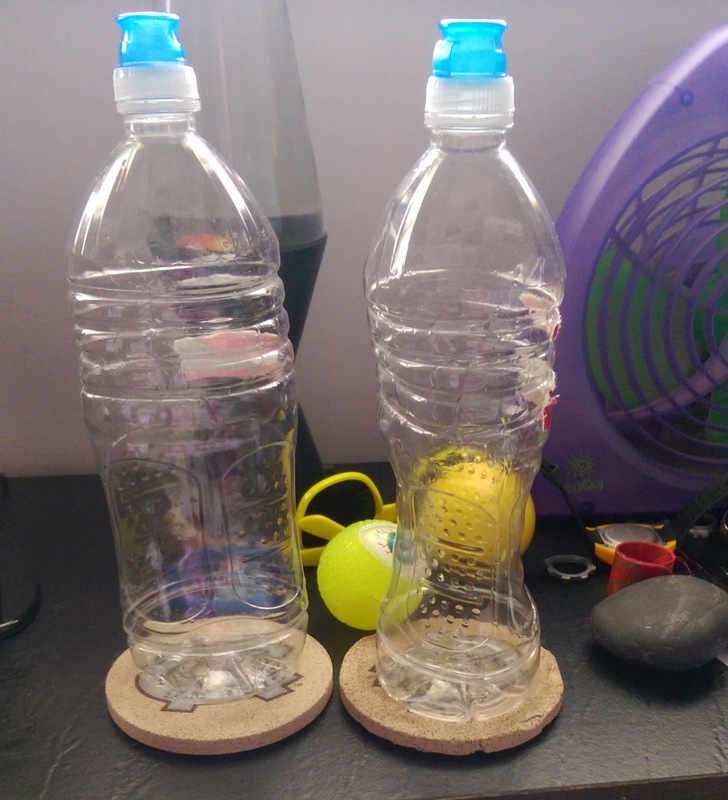 Sure enough, in his room stood his two water bottles. Totally empty. Two. Not one. And not one half. Today I replaced his 23.6 ounce water bottles with an 8 ounce bottle. Such a little bitty bottle compared to the others! You should have seen his face when I showed it to him! Half amusement and half surprise and half disgust. I guess that’s one too many halves for just one bottle. One. Not two. Dr. Broberg had no idea of the complications this fluid restriction would cause in Aaron’s life, and therefore ours as well. How could he? Living with autism is complex enough on a “normal” day. Throw in restrictions and changes and routine disruptions, and you have a mess on your hands. Day Number Three: Today is Saturday and Aaron is happy. We hope that this happiness lasts. He does have three cups of coffee, partially full. Three. Not two. He has one little water bottle. One. Not two. And I do have hope that we can make this work. I have hope on this day three. I did not have much hope on day two. Let’s pray that we can look back on this day three and see it as a successful day. Then I will want more days like this one. Day three. Not day two. 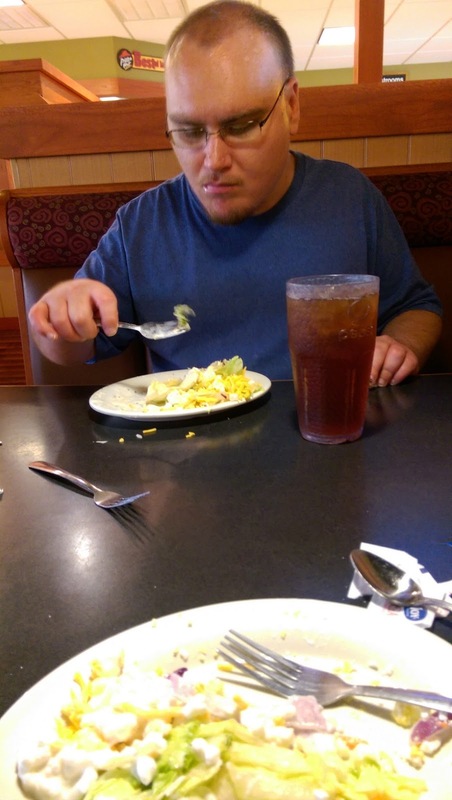 Author hesaidwhatksPosted on August 22, 2015 February 28, 2016 Categories Adult Autism, Asperger's Syndrome, Change, Epilepsy, Special Needs AdultsLeave a comment on Day One……Day Two…..Day Three…..
It’s very interesting, as we live this life with Aaron, how we see all the ups and downs that go along with autism and Epilepsy and developmental delays. We not only see the ups and downs, but we deeply experience their effects on him personally and on us as well. Certainly anything that affects Aaron impacts Gary and I, too, and what a ride it can be! Aaron really wants to enjoy happiness, but he wants it on his terms. Sometimes that’s just not possible. There are occasions where Gary and I walk a fine line as we attempt to provide a happy environment for Aaron without giving in to his every whim. It’s like being on a boat. We can be trolling along, happy and peaceful, and then all of a sudden we run upon choppy seas that threaten to overturn us. Some days we can see the storm coming with Aaron as we read his mood. Other days the storm swirls in out of the blue, unexpected, catching us off guard and then demanding all of our skills that we hoped we’ve learned over the years of parenting Aaron. I laughed at the funny way he phrased his comment, and then he laughed, and all was well. The next day he was more adamant about not wanting to go. Aaron loves Paradigm, but his dream life would be to stay home every day playing on the computer or watching movies. That’s not going to happen and he knows it, but he still tries to test those waters. He did go to Paradigm, but he did slam the van door and so I prayed as I drove away that somehow he would have a good day. Barb said he was VERY grouchy when he came in but then settled down and had a really great day. Yay! Not yay for VERY grouchy, but yay that the rest of the day was great. Aaron pushed my buttons when he got home, blaming me for ruining his dream life and other ills as well. Supper didn’t suit him, so Gary and I actually enjoyed a nice meal alone with uninterrupted conversation. May as well see the silver lining in the cloud. Later, Aaron and I had a talk, where I got firm and Aaron saw the light. He was nice the rest of the evening…..almost. Then came bedtime. Why do so many things happen at bedtime?! For instance, a couple weeks ago it was time for bed and Aaron knew it was time for bed. If anyone knows anything about time, it’s Aaron! But he was watching a movie, not wanting to quit until he was at some magic point, and so I did all the bedtime chores I do for him….and still he sat at his desk, engrossed in the movie. So I said goodnight, with some aggravation in my voice, and went to my bedroom. I locked the door because I figured I would be followed. Sure enough, I soon heard Aaron’s heavy steps coming up the hall. He knocked loudly on the bedroom door and then said, “Mom! I want to say goodnight in my room!” You see, I hadn’t said our goodnights in the proper Aaron way. I sighed and opened the door, where Aaron repeated what he had said about saying goodnight in his room. So out went his arms again and this time I had to smile, more inside than out, as I gave him another hug. I tried to make this hug more sincere, and I even did smile an outside smile as he stared at me again. “Are you happy?” he cautiously asked. And I assured him that I was happy, so that he would be happy, and I finally was released to go to bed…..at last! His insistence on going to bed happy really was the right thing to do, much as I didn’t want to participate at that point, and his perceptions were also pretty amazing. Back to Monday night. On Monday night I found myself wishing with all my might that Aaron wanted to be happy. You see, Gary and I are getting ready to paint Aaron’s bedroom. Gary has patched Aaron’s walls, but on Monday night Aaron wanted to show Gary a huge mark on his otherwise repaired wall. Gary was shocked to see the mark. We both think that Aaron made that mark on Monday morning when he was mad at me, but Aaron wouldn’t own up to that at all. In fact, when Gary asked Aaron when he had made the gouge in the wall, Aaron hit the roof. Boy, did he ever react!! Aaron accused Gary of accusing him of making the mark. “Well,” Gary replied, “who else could have made it?” Aaron was beyond furious. He became livid. Gary and I both ended up in Aaron’s room, where Aaron erupted over and over. He was in a full meltdown, and it wasn’t pretty. It’s actually very amazing to see the progression of his thought processes when he’s out of control like that. I’m just thankful that we don’t see this scene very often. He never owned up to making the mark, but he sure did fling out all sorts of insults and angry comments. I told Gary to go on to bed, and I sat with Aaron for awhile. He was mad at me, too, at this point. He watched a movie for a few minutes and then commanded me to leave his room. What happened to happy? It was totally gone at that point! I went to our bedroom, where Aaron followed and barged in, yelling some more and refusing to leave. He did finally leave and he did stay in his room. He went to bed around 12:30. I’m sure he wrote down the precise time in his journal. He went to Paradigm the next morning. I praised him for his maturity. When he returned home that afternoon, I could tell that he was still struggling with some anger. Yet when Gary got home, Aaron was fine. We had supper and a pleasant evening, which was so welcome after the awful anger of the night before. Aaron asked me to tell Gary what I had told him about being mature, so I told Gary how mature Aaron was to go to Paradigm without a fight. Aaron stood there rubbing his hands together as I praised him to Gary, so happy at those words…..at last! 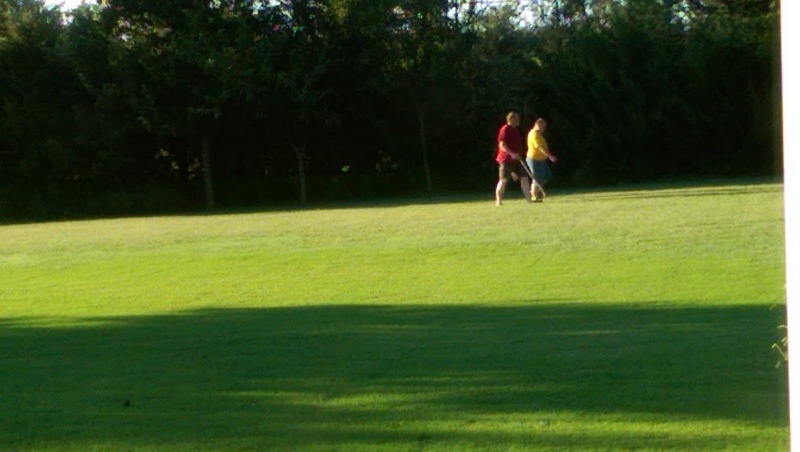 Yesterday after supper, Gary and Aaron took a walk out in our back yard with Jackson. 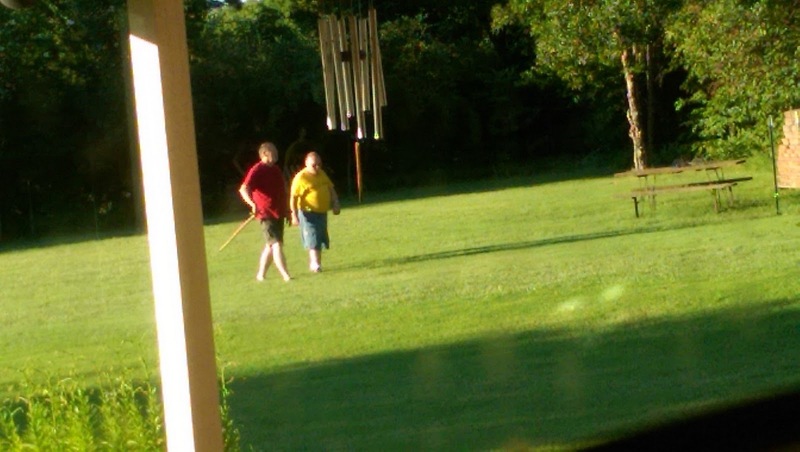 I looked outside and felt warmed by the sight of the two of them walking together. What a picture of reconciliation! The restoring of relationship is something we do fairly often with Aaron. We must….because we love him and because it’s right. All of us have these family moments and life moments where we have to come together again with those who have angered or hurt us. Gary and I have to be the adults in these situations with Aaron. But I guess that’s not always true, is it? Didn’t I just tell about how Aaron came to get me when he knew I wasn’t happy? How he insisted on being happy before we went to bed? So I know that there are times when Aaron can and does get it right…..and I have it wrong. Our boat is once again sailing calmly. He knows that tomorrow is Friday and that I’ve agreed with his request of a Papa Murphy’s pizza for supper. Yet I know that the winds can change direction at any time, and another storm can blow upon us. I know that I will once again, at some point, be asking what happened to happy. Let’s pray that happy hugs are all it takes next time to bring the ship upright and make it steady again. Let’s hear it for happy! And hugs! Lots of happy hugs! Author hesaidwhatksPosted on August 20, 2015 February 28, 2016 Categories Adult Autism, Asperger's Syndrome, Communication, Epilepsy, Family, http://schemas.google.com/blogger/2008/kind#post, Reconciliation, Relationships, Special Needs AdultsLeave a comment on What Happened to Happy? In our back yard, Gary and I have two flower beds that I haven’t done much with for the past two years. Plenty of our perennials still grow there, but some have died that I haven’t replaced. Gary is planning a patio remodel at some point, and knowing that those beds would be downsized or moved caused me to just let them grow as they will. Our tall Tiger Lilies bloomed out there recently, but now those bright orange blooms are gone. This morning I looked outside as I worked at the kitchen sink. 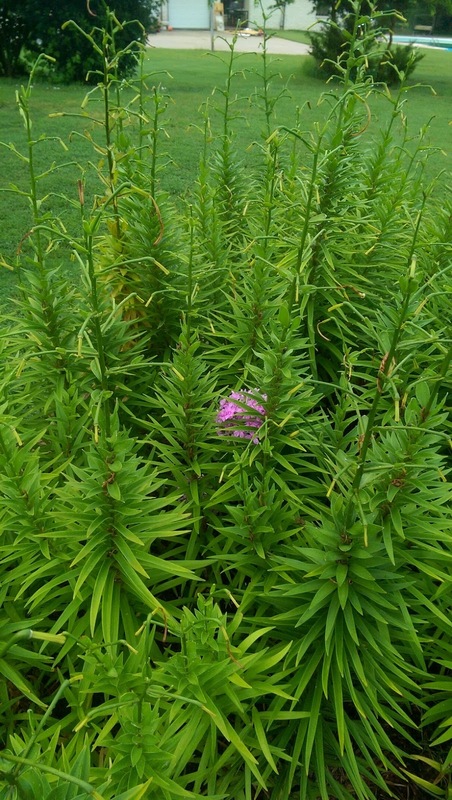 There among the flowerless Tiger Lilies I saw the bright pink blooms of a random Garden Phlox. The pink was very noticeable now that the lilies weren’t all in bloom. 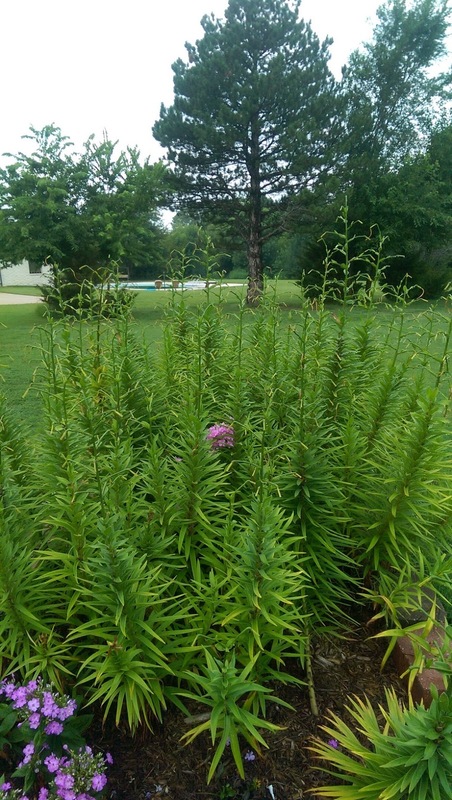 What a pretty sight that Garden Phlox was as it stood among all the green leaves of the lilies! The Phlox is shorter than the all those giant lilies surrounding it, but it stands out beautifully because of its bright, pretty flowers. As I looked at that Garden Phlox, I thought of a nurse…..a nurse that I have never met and whose name I don’t even know. Andrea, our daughter, told us about her last night. Andrea has moved to a new area of the big city in which she lives, so yesterday she had her first appointment to get established with a family practice doctor there. The doctor’s nurse who worked with Andrea was not only very nice, but Andrea said that she also gave a clear testimony of her relationship with the Lord. She was definitely born again, a follower of Jesus, so she and Andrea shared that common bond as they talked together. She then gave Andrea the name of two good churches in the area for her to visit. This interchange may seem like no big deal, but it was very encouraging to Andrea…..and a huge answer to prayer for Gary and me. As our two children that have moved far away get established in their new lives, Gary and I pray often that God will protect and lead them. Part of our prayers for them is that God will bring others into their lives who are believers…..who will be there to encourage and befriend them. It’s a rough world out there for all of us, but as parents we especially worry about our adult children as they navigate life far away from home and family. I just love seeing how God answers prayers in ways we don’t orchestrate at all. Who would have thought that God would use this nurse to speak her testimony to Andrea, to lift her up in that way, and to give her the names of two churches? But God knew just where Andrea needed to be yesterday morning. The first doctor in that group couldn’t see Andrea, so she ended up with another doctor…..who has this nurse….and she was working yesterday when Andrea was there. Thank you, God! And thank you, dear nurse, for not being afraid to speak of your relationship with Jesus. She truly let her light shine, just as Jesus told us to do, so that others will see the Lord in our lives. This nurse was a huge blessing and an answer to prayers for us…and she may never know it this side of heaven. But she was just walking in obedience, letting her light shine, and she sure did brighten Andrea’s day and ours as well. Then I have to think about myself. Often as I’ve prayed for those who will come alongside our children, I wonder if I might be on the other end of such a prayer. Could I be the one that God wants to use to answer a mother’s prayer for their child? Could I be that person who could encourage and bless a person for whom someone is praying? Am I letting my light shine in the lives of others? That thought has given me great pause over the years as I’ve prayed for our kids, and now even more so as I think of this nurse…..this random nurse…..who meant so much to our family yesterday in such a seemingly simple way. This nurse was like my Garden Phlox showing its beauty among the lilies. She was a bright spot in Andrea’s day, and she was a bright blessing to Gary and me. I need to be willing to do the same…..to grow where God has put me and to share the beauty of my relationship to Him because of what He has done for me. I need to be careful to reach out to ones that God puts in my path, in whatever ways that I can. Even the simplest acts can be just what a person needs at that moment, and just might be the answer to a parent’s or another’s prayer. So may I not let fear or selfishness or lack of caring grow around me so much that I don’t even try to help those who come into my life. I pray that I will be open to God’s leading and obedient to his command to let my light shine so that others will see God, and thereby be uplifted. May I shine like my bright pink Garden Phlox amongst all the tall, crowded lilies. I’m certainly thankful for that nurse who was a beautiful blessing in our lives yesterday. May God bless her richly as she shares His beauty with others. I saw him out of the corner of my eye as I watered one of our back flower beds on a very hot afternoon. I wasn’t sure what it was that had drawn my attention and so I leaned down slightly to see what had created the slight movement that I had seen. And there he was, with his head and half of his body sticking out of his little underground home. A small toad! So now I knew what had been living in that mysterious hole that had been dug in the mulch among the pink Coneflowers. I was very relieved that it wasn’t a huge spider, for one thing, and I also thought that this wee fellow was pretty cute. 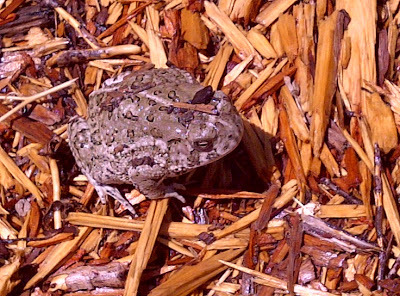 As I gently sprayed the flowers in the summer heat, my small toad neighbor just stayed where he was. And as he sat there with a little mound of fresh dirt on his head, I observed some toad behavior that I had never seen before. He lifted his head slightly as the water softly fell on him and then shook his head a bit. He blinked his eyes but didn’t seem bothered by the water that fell over his face. In fact, I thought that he was enjoying the cool shower that was cascading over his hot, bumpy body. It certainly was a very stifling day and I could imagine that he was pleasantly relieved at this unexpected relief from the dryness and the heat. Meeting God in His Word and in prayer is where my cool, refreshing relief is to be found. He is there to quench my thirst and His Word is there to revive my dry, parched soul. Then I can say along with the Psalmist, “This is my comfort in my affliction, that Your Word has revived me.” (Psalm 119:50) I want to let the refreshment that God offers me wash over my spirit. I want to lift my head, blink my eyes in wonder and praise, and let His Word revive me so that when the heat is on, my soul is calm and my spirit is renewed. Thank you, dear Lord, for the little bumpy toad You sent my way!